Where did my blog go? It's been 4 years since my last post. Thanks for the help finding the blog, Dad! Woah! So I just realized that it's been 4 months since my last blog. Not cool! All I can say in my defense is that it was a crazy busy Spring and so far its turned out to be an even busier Summer. I've been spending so much of my time hunched over text books that I haven't even realized that summer is passing me by. What woke up yesterday were the tomatoes. Juicy, red, ripe tomatoes mean summer to me. My mother has always planted tomatoes in our garden and at some point during the summer we always end up with way, way, too many tomatoes to eat. Anyways, when I'm not home to eat those tomatoes I rely on the supermarket. I was over at Kroger astounded by the low low prices of awesome looking tomatoes when it dawned on me that it was summer and I needed to by some good ole Hanover tomatoes. Kroger doesn't carry them and Ukrops used to be my supplier, but alas they are no more so off the local organic market for me. Luckily they had them. So what is a Hanover tomato? If you live in Central Virginia I'm sure you've heard of them. If you're not, then probably not so much. Hanover tomatoes aren't a special kind of tomato like an heirloom or beefsteak or cherry tomato. They are simply tomatoes grown in Hanover, Virginia and they are the most delicious tomatoes I've ever had. 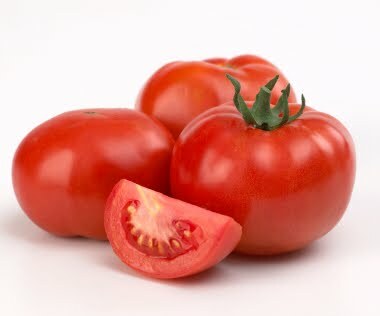 Hanover tomatoes are large beautiful red fruits so flavorful that you only need to slice and sprinkle with a little salt and pepper. Rumor has it that it's the Virginia soil that makes them taste so good and the people of Hanover County are so proud of their tomatoes that they put on an annual tomato festival every year. It's today in Mechanicsville if you're interested in going. Unfortunately I can't make it due to all this school work, but at least I've got my tomatoes to remind me that it's summer. OK, enough being a nerd, but in honor of Pie Day I'm bringing you a blog about pies. Two fruit pies specifically, a peach pie and a Shaker lemon pie. I made this peach pie over the summer after picking way too many peaches at Carter Mountain Orchard up in Charlottesville. No matter how delicous peaches are you can only eat so many. To make this pie I basically used my normal apple pie recipe, but substituted peaches. The ingredients were peaches, sugar, lemon juice, ginger and flour. It turned out pretty nice and was delightful with vanilla ice-cream. My one hang up with the pie had to do with removing the peach skin. There's a rumor going around that if you cut an X in the bottom of a peach and then it blanch in boiling water then the skin will peel right off. This does not work. I repeat, it does not work. What it does is make a huge, sticky mess. I'm assuming this happened because my peaches were not fully ripe, but who knows. Try at your own risk. The second pie is Shaker Lemon Pie. I discovered this one in a pie cookbook my brother gave me. Thanks bro. Shaker Lemon Pie is named after the inventors of the pie, The Shakers. They were a popular religious group during the mid 1800's. The religion lost its popularity, but thankfully the pie is still around. Anyways, I made this pie a little while back when I was in California. It's a mix between sweet and tart and is very reminiscent of a lemon bar. If you like lemon bars you'd like it, but I found it too sweet. The main reason I decided to make this pie is because my parents have a Meyer lemon tree in the backyard. Meyer lemons are a cross between mandarins and lemons so they are naturally sweeter. Since I was using the meyers I cut back on the sugar. 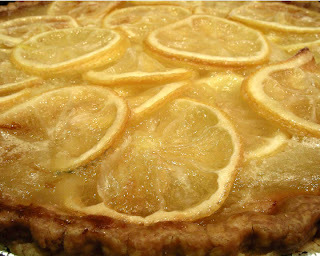 If you make this pie with normal lemons, use 3 lemons and ramp up the sugar to the original 2 cups. To make the pie wash the lemons and very thinly slice 3 of them. Slice as thinly as you can, you should be able to see through them. Discard the lemon end and the seeds. Juice the remaining two lemons and mix with the slices and the sugar. Cover and set aside at room temperature for at least 3 hours or overnight. Finally, combine the beaten eggs with lemon mixture and poor into your pie crust. Cover with the top crust or leave open like I did then bake for 15 minutes at 450 degrees. I just had to blog about Food Network's new show What would Brian Boitano Make because it is absolutely hilarious. It's actually not really new. I think the show is on it's second season, but you'd never know. For some reason The Food Network only plays the good cooking shows early on weekend mornings. I don't understand why Sunny Anderson and the most annoying "Guy" ever get nice weekday slots when they make garbage, but I digress. Brian Boitano isn't fighting grizzly bears or ice skating in the show, but he is cooking up some pretty good looking food. I just can't decide if I like the show so much because it's funny, because I'm a fan of ice-skating, or because of South Park. If you don't get the South Park reference see below. Anyways, I encourage you to check it out Sundays at 1pm. This decedent desert is light and airy and tastes like a mix of chocolate brownies and pudding. 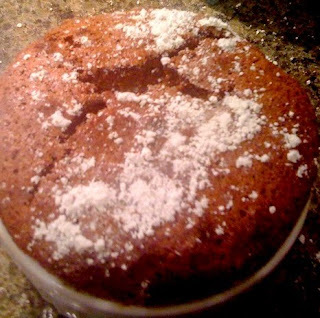 All good stuff, but the best thing about a chocolate souffle is that it's a lot easier to make than it sounds. I'm new to making souffle's, but ever since Julia Child showed me how easy it was to make I've made a couple. Yeah, I admit it. I watch 35 year old cooking shows on the Internet. You can too, click here. Making a souffle is a production. It's a lot of steps, but its fast and easy. It took the bf and I less then 20 minutes to mix and get our chocolate souffle in the oven. First, you make a roue on the stove (equal parts butter and flour).The second step is to make a white sauce by whisking some hot milk into the roue. The white sauce gets set aside while you work on the eggs. A souffle is basically all eggs. This important ingredient gives the souffle it's famous shape and height. Separate the eggs. Stiffly beat the whites and set aside. Mix the yolks into the white sauce on the stove with your flavorings. I used a little sugar, vanilla, melted chocolate, and some Kahlua. If you were making a cheese souffle this is where you'd add the cheese. Finally, you mix it all together. Fold the egg whites into the mixture and pour into a buttered and sugared souffle dish or individual ramekins. I've done both, the pictures here are from the one medium souffle. Souffles are finicky creatures. I'm sure you've heard horror stories of souffles falling or not rising. Luckily mine have always rose. Unfortunately they have also fallen, but that's not my fault. It turns out that all souffles fall. You basically have 10 minutes or less until all the air escapes. A souffle rises because all those whipped egg whites are basically pockets of air. 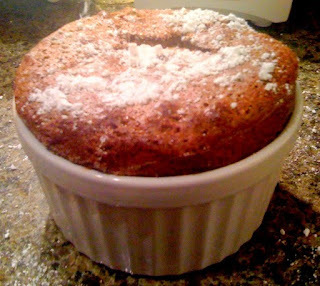 As the souffle heats, the air in the pockets expand and cause the souffle to rise. The stiff sides of the baking dish help the souffle rise up and not out and this is why you should never bake a souffle in a rounded dish. Anyways, once the souffle is out of the oven, the air inside those pockets start to cool and with that your souffle starts to deflate. When this happens I get a little sad. I know its gonna happen, but you invest all this energy into wondering how much the souffle will rise and then there's just a few minutes to marvel at the beautiful creation before the air fizzles out. My recipe is below. It is halfed from an original recipe with a few personal changes to make two chocolate souffles in individual ramekins or one medium size souffle. Enjoy, but I'm warning you its rich. I get full after eating half a serving, but I always have to push on or the bf tries to eat mine. Luckily, for both of us there's no way a souffle can be that bad for you. Again its mostly eggs (healthy protein) and you'd be surprised to learn what a small amount of sugar and chocolate goes in. Bake 25 to 30 minutes at 400 degrees. I was browsing the local Virginia section of Kroger trying to pick out some gourmet Virginia Peanuts for the family in California when a package of spoon bread caught my eye. I had absolutely no idea what spoon bread was, but was intrigued when I read on the package that it is a traditional dish from the 18th century with the consistency of bread pudding and the flavors of cornbread. The company that makes this 18th Century Spoon Bread mix, is named Byrd Mill and has been in existence since 1740. Turns out that Patrick Henry actually used to come to the mill as a child. I find very cool to be able to pick up a genuine piece of history at the local supermarket. I would like to tell you how I made spoon bread, but truth be told I didn't cook it. I handed it off to the boyfriend, but I can tell you that the baking mix contains old fashioned white cornmeal, natural unbleached flour, sugar, baking powder and salt. The mix started off on the stove, milk and eggs were added at some point and we had a discussion on how to beat out all those lumps. The directions were not very clear so we poured it in the mixer. I know that colonial cooks didn't have Kitchen Aid mixers, but as long as were on the subject they didn't have baking mixes either! The batter was then poured into a baking dish and finished in the oven for about a half hour. Spoon bread is actually really good. It's no wonder that history tells us it was a favorite of our first president, George Washington and that people during the revolutionary war lived off the stuff. The dish is dense, slightly sweet with a silky smooth texture and a mild corn flavor. Like the name suggests, you eat it with a spoon. You could actually cut slices out of the casserole dish, but I dug right in. Spoon bread might be known as Southern food today, but the origin is actually Native American. Records show that during the winter of 1607 the Powhatan Indians took pity on the starving settlers of the new world in Jamestown, Virginia and taught them to plant and cook corn. Thank goodness they did or we wouldn't have spoon bread. Or the United States for that matter! Yesterday the boyfriend and I took a drive to Urbanna for the 52 Annual Oyster Festival. 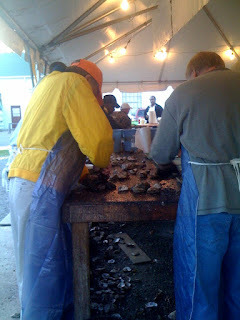 This is Virginia's Official Oyster Festival and as far as food festivals go this is a fun one to visit. I don't even like oysters, and still had a great time! Urbanna is in Tidewater Virginia about an hour and a half from Richmond. It is on the Rappahonnok River just down stream from the Chesapeake Bay which makes it a perfect spot for farming oysters (more on that later). This historic town has been around since the 17th century and is a quaint place with a population under 600. Once a year the quiet is shattered for the festival and this tiny town is overrun with thousands of visitors. The Oyster Festival is so large that they actually close the one road into town. That means that in order to attend the event you must pay $20 to park about a mile away on empty fields and then walk in. This was a surprise, but it was a gorgeous, warm November day and the walk into town is beautiful. 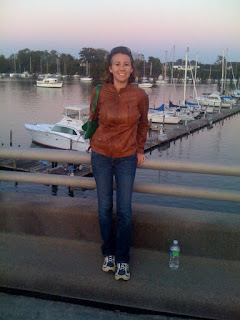 That's me below posing with Urbanna's Marina on the walk back. As for food, the festival was a seafood lover's dream. As expected oysters were everywhere and prepared every which way. Raw, roasted, fried, in stews, soup or served up in huge fritter sandwiches and they were all freshly shucked (see below). An oyster shucking contest was even held earler in the day. Beside oysters, there were crabs galore. I got a bowl of Cream of Crab Soup for lunch and while it was nice, it was no she-crab soup. Unfortunately that delicacy was no where to be found. Fresh shrimp and scallops concoctions were everywhere as were fair food favorites like turkey legs and funnel cake. By far the most amusing part of the day was when an expert oyster gardener befriended my boyfriend and I and told us everything we ever wanted to know about oysters and more. 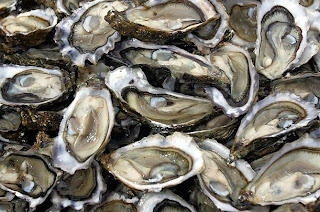 Here are the basics: baby oysters are called spats. Spats are tiny, only about the size of a fingernail, but after 10 months in the water these babies grow into full sized, edible oysters. They actually can be eaten sooner, it depends how big you like them. The spats are placed in floating cages and for the most part they are left alone. The key is to have lots of water flow running through the cages because that's where the oysters get their nutrients. Every once in a while the gardener has to go out and clean the oysters, upgrade the cage size and throw off the crabs that may have accumulated. It sounded so easy that I decided that if I ever get a place on the water I might have to try out oyster farming. Late in the day we made our way out of the crowds and down to the water. Out at the Marina a band was playing classic rock, oysters were being smoked and locals were drinking on yachts. In my opinion that is the perfect way to enjoy the festival so if you happen to own one of those boats and need another friend let me know!